Forest City Fashionista: Signs of Christmas...Carollers! 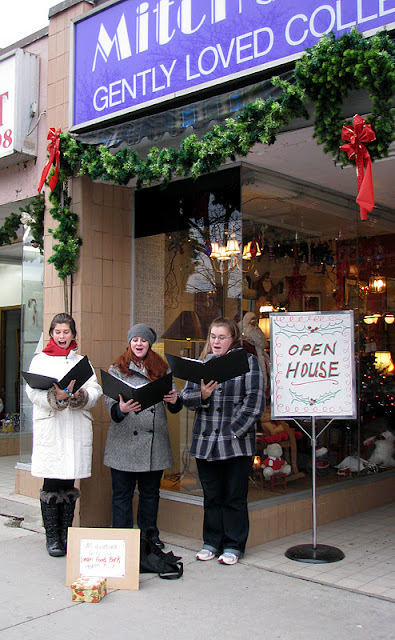 These young women were harmonizing beautifully outside of Mitch's Treasures for their open house on Saturday. Mitch's Treasures, located on Dundas between Elizabeth and Adelaide, has a carefully selected inventory of used furniture, lamps, and other decorative items at very reasonable prices. Yup, my local radio stations started playing Christmas songs. Lots of huge discount sales going on. One of the BEST Gift Ideas Ever!